“The perfect woman’s task is to be a mother, and a lover, and a warrior. Then we can say that a Princess became a Queen” – Bernard Werber wrote in his book “The Empire of the Angels.” And it is hard to disagree with it. Especially when we have the obvious case – the life of legendary women. 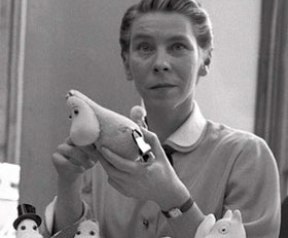 First of all, probably the best-known Finn-woman of all the times is Tove Jansson, the creator of the cutest creatures – The Moomins. The world fame has come to Tove after the publishing of the first part of Moomin’s epopee. She has drawn also the pictures and has adopted the novels into the theatre plays. But the fact is that Tove herself has always told that first of all she is an artist, and hasn’t taken her literary activity seriously. Among the works of Jansson as an artist best known are: The canteen at the Strömberg factory at Pitäjänmäki, Helsinki, The Aurora Children’s Hospital in Helsinki, The Kaupunginkellari restaurant of Helsinki Town Hall and so on. Also she has made the absolutely adorable comics about Moomin for American newspaper “Evening News” published by powerful Associated Press. Originally Jansson has personally drawn each page of comics, but soon she got bored with this job and she gave it to her brother, Lars. And that wasn’t a great surprise – Tove and her brothers (Per Olov and Lars) grew up with dad-sculptor Viktor Jansson and mum-graphic designer Signe Hammarsten-Jansson. But Tove had a twofold sense for the fallen on her popularity. On the one hand, she irritated the excessive commercialization of her work, on the other hand, that was a huge income from all kinds of products with a Moomin theme allowed her to rent and then buy Klovharu-island in the Gulf of Finland, where she was able to hide from journalists and fans. All in all the copyrights for Tove’s novels belong now to Lars’s daughter Sofia, because unfortunately she had no children. When Tove died, that was a national mourning day, while her contribution to Finnish literature and art is truly inestimable. On the other side of The Finnish National Theatre, in Kaisaniemi Park, there is a monument. That is an original abstract sculpture represented the Curtain. That is dedicated to another great example of, speaking like Beyonce, “single lady”, Finnish actress Ida Aalberg. When she was first 23 years old, Ida has already performed not only in native country, but also in Hungary, Germany and Russia, and a little bit later she has got her winner-ticket – the role of Nora in the good-known play “Doll House” by Henrik Johan Ibsen. Since then Ida was gradually strengthened over the status of the national treasure. A lot of actors say that the role of their dream is Hamlet. Well, Ida, in some respect, was one of the luckiest – she was Ophelia, the lover of Hamlet. After the death of her first husband, Ida married Alexander Johann Uexküll-Gyllenband and moved to Russian Empire. Had she fears to go to the foreign country? Maybe, but there Ida had anyway a good career. But in 1906, after the death of Kaarli Bergbom, she has taken the lead in the Finnish National Theatre. The art of Aalberg, one of the best Finnish actresses, distinguished by great dramatic force. She has created images of love and suffering, of a women with deep feelings, integrity and passion. On June 17 1952 in Long Beach, California the first Miss Universe contest has taken place. There were thirty contestants participated and one of them – 17-old Armi Kuusela from Finland. And exactly she has taken a crown. Of course that was incredible, deafening success. When she was back to home country, it was immediately decided to create a movie dedicated to Armi – Maailman kaunein tyttö (World’s most beautiful girl), where she played herself. Afterwards Armi has chosen the way of actress. She was starring also in musicals with her husband, Filipino businessman, Virgilio Hilario, whom she had met during her first journey round the world. Of course nowadays is Armi one of the examples of “how to be a great Woman”, but that wouldn’t be full without knowing that she had 5 children. And no one of those daughters and sons live in the same country now: Arne Hilario (lives in Chile), Anna-Lisa De Gari (lives in Spain), Jussi Hilario (lives in Canada), Eva-Maria Hess (lives in United States) and Mikko Hilario (lives in the Philippines). No matter that people say that politics isn’t ladies business, still there are instances of such women. For example, Finnish president Tarja Halonen. In her youth Tarja has radical leftist views, she took also part in the pacifist movement, was a fan of Che Guevara. Tarja has even left the Lutheran church after women were denied ordination. In 1980-1981 she was a chairman of SETA (Fin. Seksuaalinen Tasavertaisuus ry -”Sexual Equality”), an organization that protects the rights of sexual minorities. Of course that’s possible to talk about this great woman never-ending, but still there was a specific US-joke – on of the American talk show hosts Conan O’Brien compares to Tarja a lot. After joking about this for several months, he travelled to Finland, where appeared on TV and met President herself. And now let’s move to the hero of our days. It seems that a lot of people know exactly who Leena Peisa is. Well she is one of the member of freaky band “Lordi” that had won Eurovision song contest in 2006. Actually in “Lordi” she has a specific nickname – Awa that means “Be Aware”. Also she takes on the persona of an unearthly Vampire Countess in her “home band”. Of course there was a real hysteria around how all the members look in there normal life. But still no one knows (probably only the nearest and dearest). But anyway there was a precedent, when Daily Mail credited a photo of a woman (without make-up) as being Awa. But she disclaim that information. Despite the small size of Finland, almost anyone can become a “dream woman” in this country. What is that – the legendary Nordic hardening or Protestant morality? Answer is difficult, but thanks to the Finnish emancipation (in the best sense of the word), ladies have taken the leading position in the world.